– Covertly locate vehicles, assets, and inventory. Silently locate teens, loved ones, and elderly persons. – Simple to use – sign in and start using in minutes. 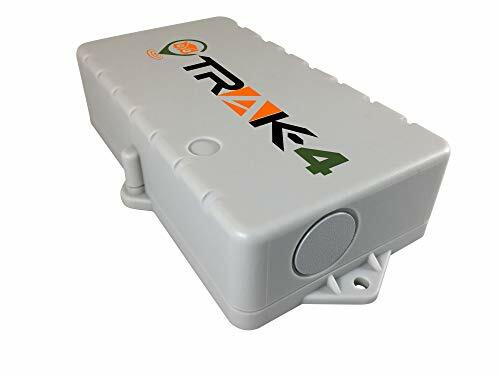 – Indoor/outdoor, Trak4 is weatherproof so you can mount or place it almost anywhere. Rugged commercial housing is durable and provides reliability and dependability. – No GPS? No problem. Trak4 cellular trilateration gives approximate location when no GPS signal is available (inside garages, buildings, etc.). – High-capacity rechargeable battery. Single charge lasts more than a year (one ping per day). – Choose reporting frequency from daily to every 2 minutes. – Get text or email alert when person or asset leaves or enters a selected area (geofencing). – Works in US only. – 3G with 2G fallback provides the very best coverage area available. – Add multiple Trak4s to your account – view all of your trackers on one map. – Includes PVC adhesive charge port covers.